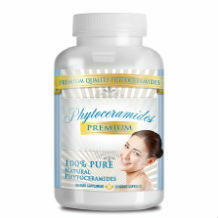 Phytoceramides by Potent Organics is claimed to reduce the appearance of wrinkles in all the areas of the face. It gives the skin a renewed look of healthy skin. It firms the neck and chin, including the cheeks and tones out all sagging skin that may be on the face due to the effects of aging. This product is free of gluten and has natural ingredients in it that help in the formation of new cells that in turn promote hydration, sealing moisture and rejuvenating collagen production. It also helps in the reversal of skin damage caused by different factors of one’s lifestyle. Fine lines are decreased and replenished with hydrated cells which make the skin appear evenly toned and plump. It is also FDA approved, made in the highest quality standards and guarantees purity in the product. It is recommended that that the average dose should be one capsule per day, If you would prefer, 2 capsules is okay. there are no side effects stipulated for the Phytoceramides by Potent Organics. However, seek the advice of your doctor to see if it is okay that you consume this product. 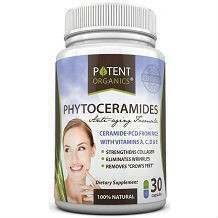 The price for Phytoceramides is twenty one dollars and eighty seven cents for a thirty day supply. The product does have a full refund guarantee given on the website, although it will expire if you exceed thirty days from the moment you purchased it. The ridiculous part is that you cannot get a full refund unless the product is unopened. It amuses me when manufacturers give these kinds of conditions because that is just not practical. Why buy it in the first place if you are not going to open and use it? This is a ploy that ensures being stuck with the product even when you don’t want it. It is a sly tactic and it makes one question the manufacturer’s overall honesty about the product. It will do the job as suggested, The ingredients are all known to combat all the signs of aging. The supplements come in vegetable capsules, so it is quite the delight for vegetarians. If you want honesty and clarification for a product, then as a manufacturer, it is crucial to stipulate a solid, well defined guarantee. Even though the product is FDA approved, their marketing strategy is lacking because consumers need to know that you support and fully have faith in your product, by putting a guarantee in place. How do you buy a product that you can only return only if it is unopened? Isn’t the whole point of buying it to use it? Quite frankly, the logic is baffling.